1. (1) Josef Newgarden, Dallara-Chevrolet, 108.068. 2. (9) Scott Dixon, Dallara-Honda, 107.713. 3. (22) Simon Pagenaud, Dallara-Chevrolet, 107.585. 4. (12) Will Power, Dallara-Chevrolet, 107.372. 5. (27) Alexander Rossi, Dallara-Honda, 106.051. 6. (28) Ryan Hunter-Reay, Dallara-Honda, 105.991. 7. (30) Takuma Sato, Dallara-Honda, 108.845. 8. (20) Jordan King, Dallara-Chevrolet, 108.817. 9. (5) James Hinchcliffe, Dallara-Honda, 108.685. 10. (6) Robert Wickens, Dallara-Honda, 108.662. 11. (88) Conor Daly, Dallara-Chevrolet, 108.401. 12. (4) Matheus Leist, Dallara-Chevrolet, 108.146. 13. (15) Graham Rahal, Dallara-Honda, 85.984. 14. (98) Marco Andretti, Dallara-Honda, 106.854. 15. (14) Tony Kanaan, Dallara-Chevrolet, 85.763. 16. (21) Spencer Pigot, Dallara-Chevrolet, 106.833. 17. (18) Sebastien Bourdais, Dallara-Honda, 85.565. 18. (59) Max Chilton, Dallara-Chevrolet, 106.681. 19. (32) Rene Binder, Dallara-Chevrolet, 84.719. 20. (23) Charlie Kimball, Dallara-Chevrolet, 106.395. 21. (10) Ed Jones, Dallara-Honda, No Speed. 22. (26) Zach Veach, Dallara-Honda, 106.175. 23. (19) Zachary Claman De Melo, Dallara-Honda, 106.026. 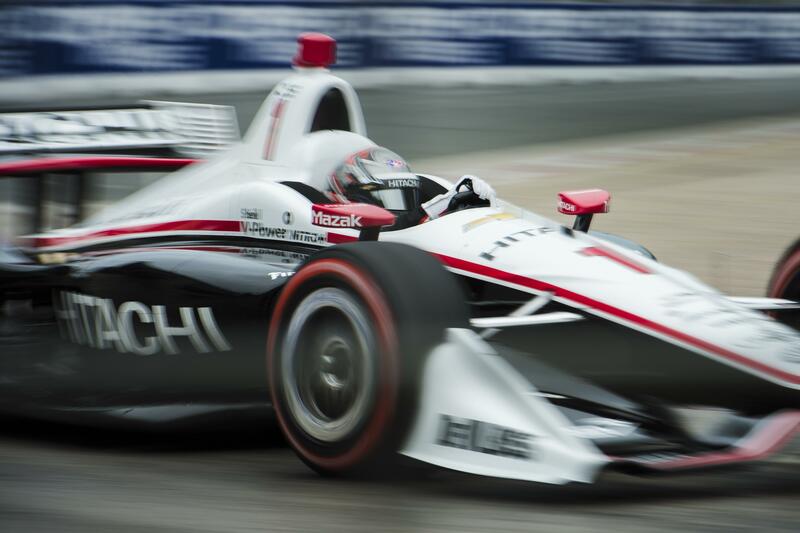 TORONTO – Josef Newgarden took advantage of a rapidly drying track Saturday afternoon to take the pole position for the IndyCar race at Toronto. Dixon set a course record earlier in qualifying on Saturday, clocking a time of 58.5546 in segment two. All of the top six drivers broke Pagenaud’s record in segment two. His mark of 58.9124 was set last July 15. Pagenaud’s record was vulnerable in part because the current track configuration is only a year old. Takuma Sato (58.6777), Newgarden (58.7750), Will Power (58.8758) and Alexander Rossi (58.8997) also bettered Pagenaud’s track record during practice Saturday morning. However, practice rounds do not count for the purpose of track records, keeping Pagenaud’s record alive for a few more hours. James Hinchcliffe spun out in segment two and was penalized for creating a localized yellow, putting him in ninth with a time of 59.1581. Hinchcliffe’s Schmidt Peterson Motorsports teammate Robert Wickens was 10th in 59.1705. Rain between practice and qualifying left the track in downtown Toronto slick, forcing many drivers to switch to softer red tires during the qualifying laps. As a street course, drivers have to adjust quickly to different textures on the road. Several drivers lauded the city of Toronto and race organizers for repaving Turn 1, where cars turn off Princes’ Boulevard, onto Canada Boulevard, and then on to the lengthy Lake Shore Boulevard straightaway. Published: July 14, 2018, 6:17 p.m.